Never has it been easier to guide your drill for perfect dowel holes! The optional 1/4" guide package enables use of the Dowelmax system on narrower 1/2" or 5/8" stock using 1/4" dowels. 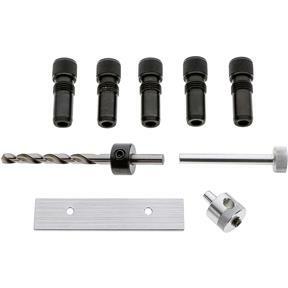 The package contains 5 hardened steel drill guides, a drill and collar stop, a 1/4" index pin, a 1/4" distance gauge base, and a 1/8 spacer with cap screws to enable centering on 1/2" and 5/8" stock.